First there were spods, then came the Spomb – and everything changed. Launched in 2010, the British-made bait rocket took freebie distribution to a new level. Spillage was eliminated, reeling back in after casting became effortless, and almost everyone ditched the traditional spod for these new devices. However, after nearly a decade of dominance, the Spomb’s hard-won crown is being challenged by an increasingly large field of rivals. To assess the state of the market, we decided to round up half a dozen bait rockets and take them fishing. We used all of them in real angling scenarios and have assessed them based on their individual attributes. Let’s not underestimate the importance of this product. Not as revolutionary as the hair rig, granted, but perhaps not far behind in the way it completely changed the game. You could perhaps even attribute some of today’s monster carp weights to the Spomb’s ability to make baiting up so much easier. Now nine-years-old, the Spomb continues to sell thousands and continues to work very well. The nose-mounted release button operates almost flawlessly, though regular users will have experienced a non-opening every now and then, mostly due to misjudged casts. It flies straight and true and can be punched huge distances in the right hands. We’ve tested the large version here, but for most average casters the midi option is perhaps the wisest choice. We’d also love to see one with an integrated float, rather than having to buy an external one to comply with some fishery rules. This is the new kid on the block, straight from Italy via Taska in the UK. Uniquely, this device uses magnets to seal itself in flight. It also opens in quarters rather than in half, so you can fill it like a conventional Spomb or prise open just one quarter to use it one-handed like the Fox Impact Spod. In your hands, the magnets feel almost too strong to open on impact with the water, but they do – with almost faultless regularity. It also skips across the water on the retrieve. Our slight niggles are with the quality of the plastic, which feels slightly less premium than other tools on test here, and the blunt nose which seems to slightly hinder stability. With heavier loads, it is no problem at all and the Spider Spod performs brilliantly, but with lighter baits it can wobble a little in flight. The magnetic seal is genuinely impressive, making this the perfect bait rocket for use with sloppy mixes. Designed in Serbia by Carp System, the Dot Spod was kept out of Britain for a long time due to legal wrangles with Spomb. Now, though, it’s distributed by Nash and seems to live happily in UK tackle shops. More streamlined than the Spomb, this thing flies magnificently and deposits its payload every time – it is incredibly reliable. It looks and feels quite simplistic, but it just works. The aperture of the hatch area is narrower than anything else on test, so loading and bait release take fractionally longer, but out on the bank this is certainly not a deal breaker. However, the load capacity is the smallest of the six, so bear that in mind if your fishing is all about hoofing out big beds of bait in the shortest possible time. Developed on the reservoirs of Mid Wales by the TFG team, this device brings something unique to the party. Unlike all the other items here, the AirBomb doesn’t open on impact with the water. Its two even halves are sprung open by a central pin that is released when your mainline hits the reel clip. Forced open in mid-air, the forward momentum of the cast propels your bait beyond your casting limit and presents your freebies in a unique scattered formation. 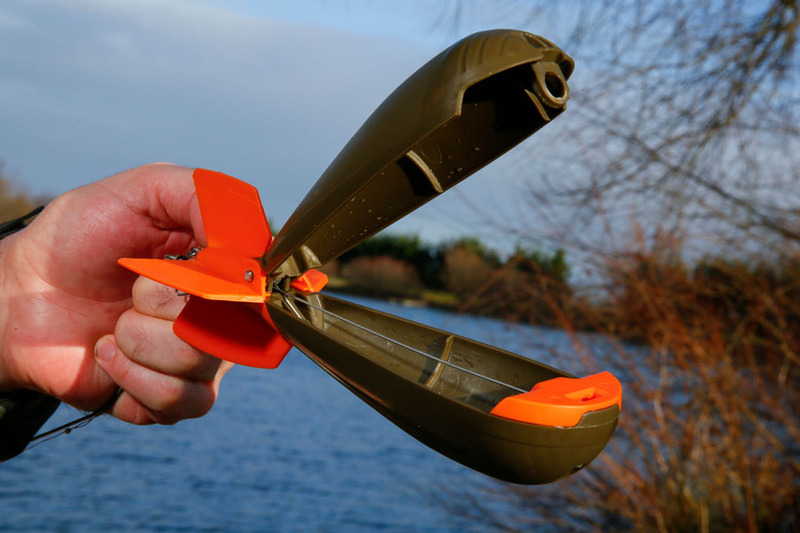 The AirBomb’s way of doing things fools birdlife, doesn’t create a noisy splash over your baited area and enables you to fling baits under overhanging trees on far margins. You can also cast it beyond your spot intact, reel in and tug it back to open with precision – though this takes considerable practice. Overall, it’s a completely new concept that does take time and skill to master, but as a specialist tool the AirBomb is without competitor. You can look at the 2015 launch of the Impact Spod as the moment the Spomb finally had a domestic rival, or, seeing as it is produced under licence from Spomb, as a sort of MK2 version of the market leader. This feels the most quality product of the bunch, and has a nifty hatch system to enable one-handed operation. The nose-mounted push-button spring seen on the Spomb has been sealed away, eliminating any annoying clogging issues, and the stabilising fins stand off the body to create a more tapered profile. There were some teething problems with the hatch’s hinge pin, but those have all been rectified, leaving a very polished product. It’s by far the easiest to fill and flies just as well as the Spomb. Its asymmetrical design, however, does mean it snakes a bit on the retrieve. Not one of these five is a duffer. All of them deposit bait quickly and accurately with great reliability. However, some are better suited to certain styles of fishing. 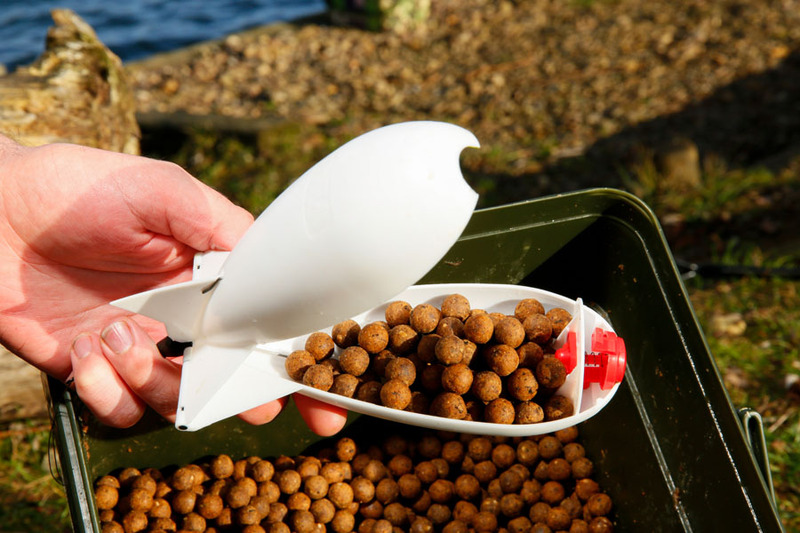 The Impact Spod feels quality and is so easy to fill, so if you do a lot of baiting up then it’s a great tool. If you want to use sloppy spod mix, then the Spider Spod’s magnet-sealed design is well worth investigating. Just don’t expect it to hit the most extreme distances. If you want flexibility, then the only two that come in different sizes are the Spomb (small, midi, large) and the Impact Spod (medium and large). Those smaller options can really help if your spod rod isn’t the best or you’re not a huge caster. The AirBomb is in a category of its own and while we probably wouldn’t choose one as our sole baiting-up device it is a real weapon when fishing up against an island or far margins, or for creating a different spread of freebies. If you can afford two devices, the AirBomb is a great specialist item to have at your disposal. The Dot Spod impressed us hugely. Its flawless opening reliability will be the main selling point for many anglers, and it casts exceptionally well. But do remember that you are slightly hampered by its limited carrying capacity and it does have a distinctive sound on impact that’s louder than some rivals. And what about the reigning king, the Spomb? It’s got the biggest capacity and flies beautifully. If you’ve already got one, there really isn’t any need to shop around.